Bike Rack FAIL: The Jaws of Death Torture Rack | One woman. Many bicycles. I’m all for creative ingenuity and building a better mouse trap. I probably wouldn’t appreciate living in Silicon Valley otherwise. And bike theft is rapidly increasing in the area. But when I see attempts to make bike racks more secure that are more like instruments of bike torture, I scratch my head: Who designed these things? Behold the Jaws of Death. I see these racks all over town, outside shopping centers, movie theaters, strip malls and government buildings built or remodeled in the 1970-1980s. The bike’s frame and wheels are secured in its jaws while an open-ended cage blocks thieves from cutting your ordinary school locker padlock. As many times as I’ve seen these racks, I’ve never attempted to use them as intended. Why subject my bike to the torture of jamming metal rods in its spokes? My cable and U-locks don’t work with the little lock cage either. Then the other day I talked to an old-time bike commuter who said he likes them. So I grabbed my old mountain bike, bought a padlock and took the old-school racks for a spin. They worked much better than expected. The designers were smart to include instructions that weathered well. The racks aren’t that intuitive. I wheeled Zella in place and carefully closed the jaws to avoid bending her spokes or scraping her frame. The padlock was easy to slide in place and protected from bolt cutters and angle grinders. Nicely secure. The non-standard, potentially damaging nature of the racks didn’t keep lots of shoppers from using it. The two bikes parked next to mine used cable locks and mostly ignored the jaws, like I usually do. A U-lock works better, and doesn’t require bringing a padlock that’s useless for most other racks. Although it seems secure, I’m not sure I’ll regularly subject my nicer bikes to this torturous rack. Would you? Location: Bloomingdale’s at Stanford Shopping Center, Palo Alto, California, USA. Those racks wouldn’t release my beater bike last time I tried it. No way I’m putting my nice bike in the jaws of death! I did have a moment of panic over whether a rack would release my bike, but not this rack. It was the one that I’m featuring next week that I call the Throat Choke. I was able tp procure these racks for my employer’s locations on the penisula in the early 70’s. (I commuted from Sunnyvale to Palo Alto at a time when I would only see 6 or so regular commuters). The manufacturer aggressively marketed these with a contest to have bike thieves attempt to steal the bikes – the racks were bulletproof. I went from carrying a chain and padlock to simply a padlock. We had to remove our saddles at some locations – but otherwise they are still being used today. They were so well made the company (Rack 3?) went out of business. I can see the attraction of only having to carry a padlock but the problem I’d have is you never know where you’ll want to lock up and a padlock alone is useless anywhere except racks like these. If all you have is a signpost, you’re screwed. Yep – also, every once in a while all of the rack 111’s are in use! You’re supposed to fit the downtube into that clamp, slide the steel bar over it and use a padlock to secure. Note also the built-in cable to secure the rear wheel. Modern bikes with fat downtubes don’t fit at all. The company that designed these is still in business and still sells this model. Ha! That’s the rack I’m featuring on Bike Rack FAIL next week! I call it the Throat Choke Torture. 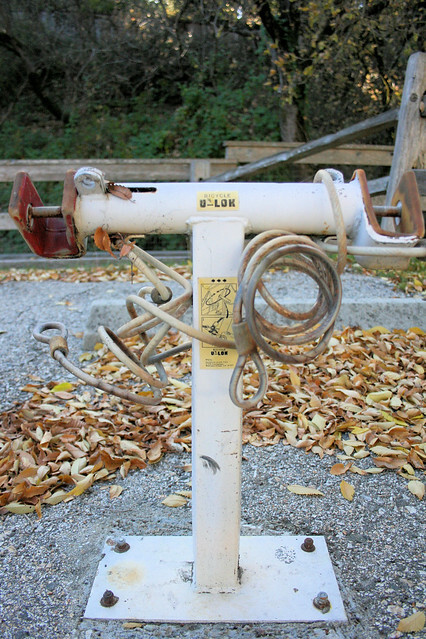 The Gamble Garden in Palo Alto has those racks, although the built-in cables are long gone. They also installed the racks too close to a fence so you can only use one side. Not that anyone uses them as designed anyway. We have one at work, but none of my bikes fit it. I have a boda boda and bike friday tandem. I used this at SCU in the 90’s with my nice bike and loved it. For a regular long commute destination it was the best. Eventually I just left my U-lock and padlock locked to it so I didn’t have to carry it.